12,000mAh touch activated portable charger with A Grade LiPo Japanese Sony battery. 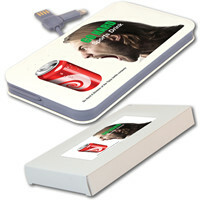 Includes integrated grey micro usb/rechargeable connector cable and fold away 8 pin fitting. 4 graduated power remaining LED indicators. Power Bank contains enough capacity to recharge most phones on the market multiple times and a full tablet charge. Can be charged up to 300 times. Takes 4-5 hours to charge. Optional box decoration or EVA black zippered pouch available at additional cost.